Do you want to improve the conversion rate of your website? Getting lots of traffic is amazing, but if that traffic is not converting, than maybe there’s an issue with the website. This infographic was made in partnership with Visme. Try out different headlines – everyone will see your headline, and very few will read anything else on your website. Are you explaining the benefits of using your product well enough? What makes your product better than the competition’s? Give out short free trials if your product allows it. Try making the page as minimalistic as possible so as to avoid distractions from the “Buy it” button. How easy is it to pay for your product? Do you offer more than one payment method? 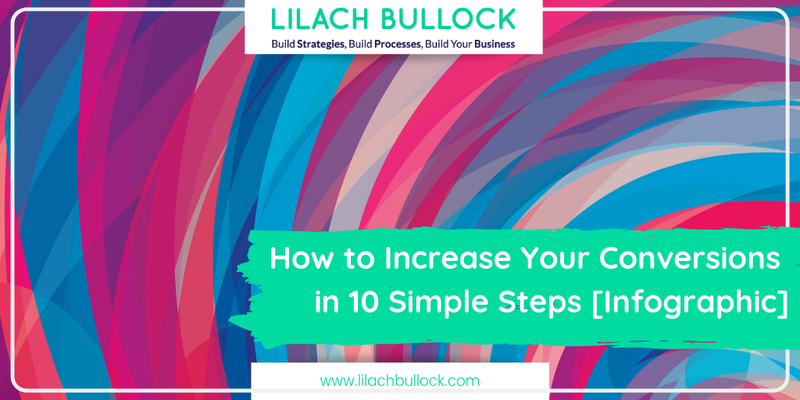 As you can see, improving your conversion rate can be a result of simply making a few small changes on your website. What other ways do you know of increasing your conversion rates? And please share the infographic and embed it on your website with the code provided below. This really an interesting and informative post. Please include attribution to http://www.lilachbullock.com with this graphic. This is a great post, you nailed the infographic! Anyway, I thought my site might interest you, if you’re looking for similar interest articles or would like to reach out and we can maybe do a blog article for each other, let me know! This was a nice simple article on how to increase conversions. This can be a bit tedious but well worth the time. Thanks Sherman. Yes indeed. Testing is so important when it comes to conversions. Small incremental changes make the most impact.